Dental implants can easily replace missing teeth to complete a natural healthy smile. Dental implants can be placed in 1 day with local anesthetic. Dental implants are cavity proof and can last as long as a natural tooth. Call or request an appointment to see if your a candidate. Dental Implants are as easy as 1,2,3. Placement of a Dental Implant with a temporary tooth or healing cap to allow for proper Bone integration with the implant. A tooth is custom made to match your mouth to allow for a lifetime of use. I was very grateful he tried to save my tooth rather than just pulling it. Join our membership club. 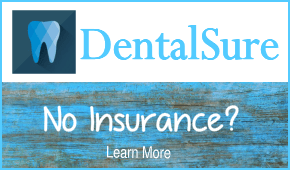 If you are retired or without insurance DentalSure is a discount plan right for you. Save money every visit.